Here is your opportunity to live in the much sought after Renaissance community. Plus, you can sit on your lanai, relax, and view the golf course directly behind the house. This lovely two bedroom, two bath, with an office/den is just the place to be. This home feels like Florida. 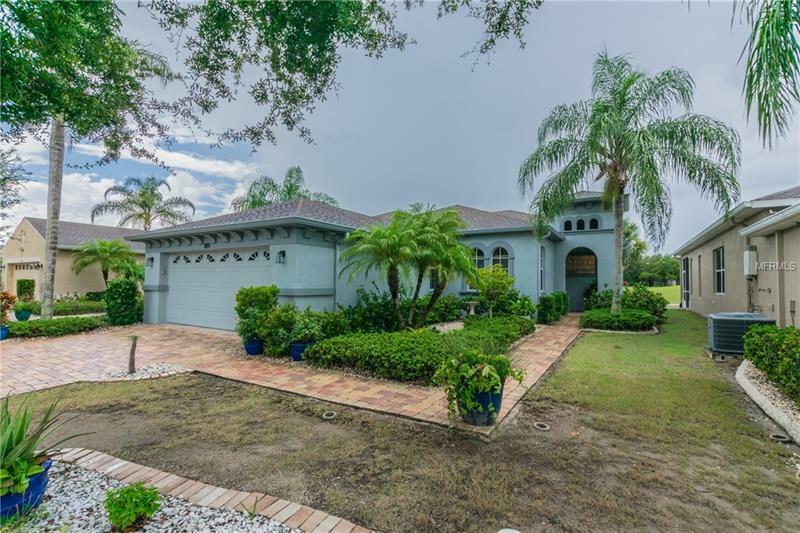 Tile flooring throughout, open floorplan offering split bedrooms, and brick pavers for the drive, entry walkway, and the screened lanai. The master bath features a large walk-in shower, dual sinks, garden tub, and separate water closet, an a large walk-in closet. The second bathroom features a tub/shower that is beautifully tiled for that special touch. In addition to the solid surface counters, this kitchen has a seldom found feature in Sun City Center – a gas stove. The master bedroom is accented with a bay window. Another great feature is the sliding doors to the lanai completely open to enlarge the living area for easy entertainment. Tray ceilings, rounded corners, ceiling fans, and plenty of natural light add a great touch to the home. Situated near the cul-de-sac, this home gets little traffic thus creating a quiet, peaceful setting. The only thing missing is your personal touch to make it your home. Pet Restrictions: Dogs must be leashed off your property. Dogs must be picked-up after.